Build USB functionality into a custom system in the form of a secure and efficient fixed port. Provide access to a PC, printer, projector, or other device with minimal exposure or repositioning. From basic port re-routes in a PC, to connections at podiums and kiosks, panel-mount cables are a great way to keep your connections clean and professional. 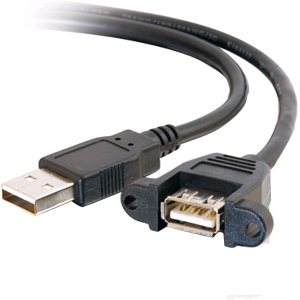 Featuring molded screw-style connectors and USB 2.0 compatibility, these cables are available in various configurations and lengths to meet your exact specifications.